If you’ve ever done pay-per-click marketing, you’ve probably read somewhere about the importance of using a good PPC landing page in your marketing efforts. However, you can’t just put together a landing page template and use it for all your marketing campaigns. Each traffic source has specific expectations, goals and pain points, so you need to know which page elements to use for each traffic source. PPC advertising is one of the most costly ways to get traffic, so it’s critical to get every possible conversion out of your visitors. In this series of articles, we are taking a look at the 6 most important elements of a successful PPC landing page and how to optimize each of those elements for maximum effect. In part one, we addressed optimizing your call-to-action (CTA). In this post, let’s talk about message match! To understand message match, we need to first take a look at your customer journey. For example, in paid search, a potential customer realizes that they have a need and types a search into Google (or Bing, Yahoo, etc). After starting their search, your potential customer sees your ad and decides that clicking on your ad will help them solve their problem. So, they click your ad. Obviously, your potential customer is looking for something specific when they click your ad. If your landing page delivers what they are expecting, they’ll stick around and potentially convert. If your page doesn’t match their expectations, they’ll leave. 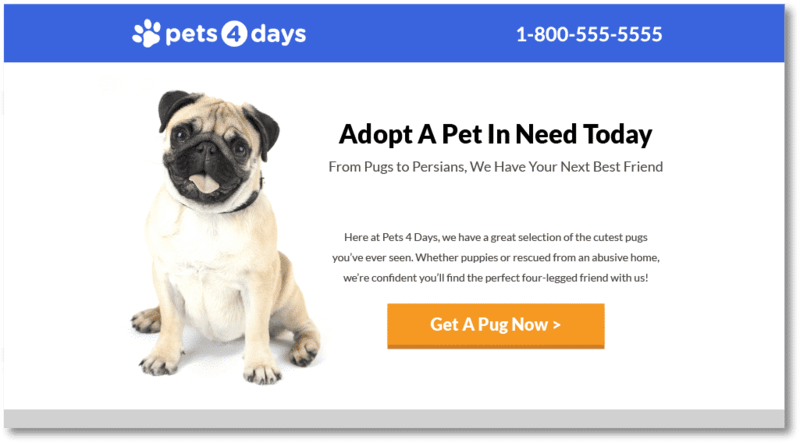 To make sure that your ad meets your potential customer’s expectations, the messaging on your landing page needs to match the messaging in your ads. In PPC campaigns, you have the ability to tightly control your messaging, which means that you should have a very good idea of why someone is on your landing page. Since you know why they’re on your page, it should be fairly easy to match everything on your page (header, subheader, CTA, body content, etc) to the ad messaging that brought your customer to you in the first place. For example, simply changing your landing page headline can have a huge impact on your conversion rate. Seems like a good fit for what you’re looking for, right? Wait a minute…where’s your cat? Did you end up on a page where you can adopt a cat? Sure. But, the headline only talks about adopting a “pet”, not a cat. Plus, the hero shot shows a dog! Does this feel like you’re on the right page? To your potential customers, it doesn’t matter if you can actually address their need. They clicked on an ad because they needed something specific and if your page doesn’t directly address their need, they’ll feel like they’re in the wrong place. In addition to matching your copy and imagery to your ad messaging, you want to make sure that your landing page messaging is simple and direct. Often, I see landing pages with long or overly clever headlines. The problem is, people clicked on your page because they wanted something specific, not because they wanted your wit. Most of the time, the simpler the messaging is on your landing page, the more effectively it will convert. Long or funny headlines usually lead to confusion…and confused audiences leave and look for something easier. Instead, start with a headline that is simple and to-the-point. You’ll be surprised how quickly this can deliver more conversions. Your landing page copy should follow these same guidelines. Although you can write more in your body copy, remember, your body copy is there to support your ad and headline messaging. Reaffirm to your visitors that the ad they clicked on was the right choice and that your business can help to solve their problem. If you do, they’ll be much more likely to convert. Unlike your homepage or general website, landing pages need to meet a very specific need. The better they match that need, the better your traffic will convert. And, as an added bonus, the better your message match, the easier it is to test your messaging from click to conversion. By creating different, consistent messages, you can nail down exactly what your audience responds best to and use that knowledge to further increase your conversion rate. So, message match helps your marketing campaigns perform better in the short-term and teaches you about your target audience over time. Double win! By the way, if you’d like me to help you optimize your PPC landing pages, let me know here or in the comments! I’d love to help. How have you used message match to improve your conversion rates?